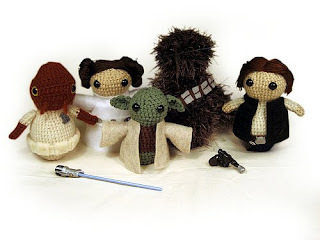 Go to Geek Central Station to check out the bloggers amazing Amigurami. There are several free crochet patterns on the blog, including various Lord of the Rings Amiguramis. I like to pretend that I will make Amiguramis someday but the truth is I just love to look and admire them. Another truly amazing artist in the Amiguami field is Beth Doherty. You can see here work at Gourment Amiguami. Left is one of my favorite creations of hers. I also would like to pretend that I would make them and I even have a kid who I could give it to...but all those little pieces...attaching arms and such...ugh. stops me in my tracks.